Swoon. I want the wallpaper, too. We brought home swatches in shades of solid red, because we are blessed with short memories. Now we’re getting somewhere. We liked the red and gold swatch (upper left corner). This swatch looked great in the store, but showed poorly on our staircase. ‘Twas too dark. Crimson’s red background will provide the drama we desire. And its cream and gray-green tones will do wonders to hide lint and other debris between vacuumings. 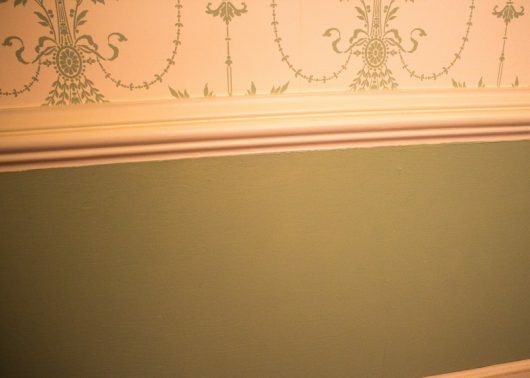 Or its pale green wainscoting. 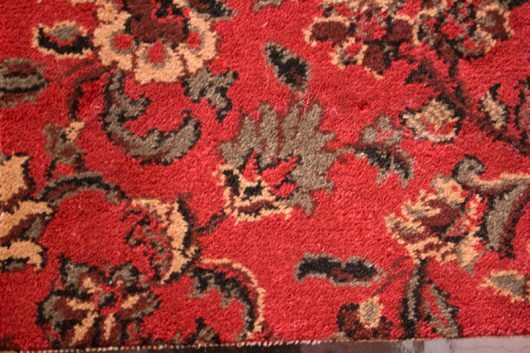 And best of all, Crimson looks like the offspring of our entrance hall runner! 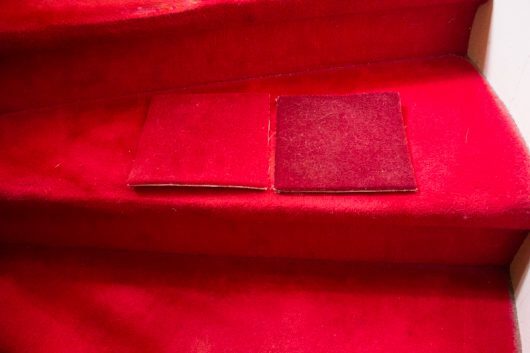 So “Crimson” is the winner in our quest for a dramatic-but-practical staircase covering. The carpet will be installed in mid-July. I look forward to showing you the finished staircase! Any projects pending in your own home right now? Talk to me in the comments field below. House Tour Part 3: The Dining Room! Great choice! Plain dark colors show every little fluff! Hi Kevin, I like your carpet choice. I can’t wait until I see the finished project. You done plenty of improvements in these past two months; the work really shows! I have so many projects going on that I don’t know where to begin. I want to put some concrete curbing to define the flower beds along the front and side of the house. I still have lots of work to do in the garden to further define the area (I’d like to fence it and build an arbor). I want to paint my bedroom. I’ve already bought the paint; I just need to do it! Plus, I want to replace my backsplash in the kitchen. I have 27 linear feet to tile. I’ve already purchased the tile, a mosaic of white marble and glass. I have the grout, mortar, tile saw, spacers, sealant and metal trim. All that’s missing is the motivation to tear the old stuff out and psyching myself up to live without a fully functioning kitchen. You’ve had great success with your projects. Hopefully, I will too. 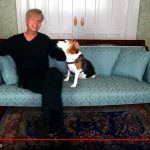 Hi Sherri – Glad you like the carpet! 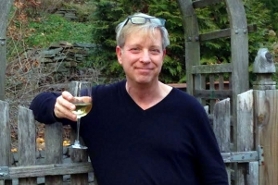 Hi Jerry – Wish I could come help you with your projects! Love your carpet choice, and I can’t wait to see how the installers deal with the pattern on the staircase curves. Detailed photos needed. Hi Susan – The installers have a big lining-up-the-pattern job ahead of them. I’ll take pictures along the way — should be fascinating to watch. Hi Kevin, I love your carpet choice for your grand staircase. I can’t wait to see it installed. Red is classy and dramatic. Did I miss the final reveal of your kitchen renovation? I loved the progress reports and now I want to see it completed. Your blog is so interesting and informative. It is a joy to read. I am always inspired by your recipes. Hi Karen – After 3 more cabinets are installed on July 13, the kitchen will be…almost done! Love your choice, the crimson will look fantastic. Just had the exterior of my 100 year old house painted. Went a little bold with the color and my immediate neighbors love it so we’re all happy. Love that choice in carpet. Great choice! Who is the manufacturer? You installer can do 1 of 2 options, I hope they present them to you. 1) you can have the pattern follow the contour of the staircase. 2) you can have the pattern run straight up the staircase. The carpet and pattern look amazing. Nice choice. I love it! Our current project is our entire house, a 1930s Spanish Revival that we’re completely renovating. We’re finally living in it now, but so much is still to be done. Fun, fun with our beagle LOL! Beautiful choice! Looking forward to the “After” photos. We’re considering re-doing our (only) 50-year-0ld kitchen, and your posts have been very helpful and encouraging. Any chance of an update on the garden soon? Here in Ohio, we’re in Herb Heaven. A great choice, won’t even see the fur. Great choice, Kevin! I love the pattern and colors. I’m STILL working on my kitchen! There was a hold up on the soapstone counters and sink. And then, when they finally arrived from Vermont, one of the countertop pieces was cut too short. Ugh. So now, waiting for the new piece. Then, it’s on to the backsplash. I’m leaning toward subway tile, as well, but someone on your board mentioned beadboard, and I’m now considering that option. I’ve already got some of it in the room, so it would tie in nicely. Decisions, decisions. I love the new carpet choice too. The colors are beautiful. It won’t show much at all. As an older person, my only concern is that the pattern will camouflage the edges of the stairs. That won’t be a problem if the stairs are well lighted. I also like the Crimson one. It will be very dramatic. I always enjoy your website. Also, Kevin, the crimson doesn’t pull focus from the rest of your entry way like the red did! I love your choice, Kevin!! It does go beautifully with the wallpaper and runner. ❤️ Your projects are always so much fun to watch and it’s so interestng to see the processes you go through. Looking forward to seeing photos of the new staircase! I have a big project facing me… getting the exterior of my house painted and I am still dithering about color. The house (a Garrison which has no lawn and is surrounded by shrubs, small trees, and cottage gardens) has been a creamy yellow including all the trim for 25 years!! Time for a change? My only real constraints are 1) the “garage” was turned into a garden shed two years ago with barn doors, strap hinges, and it’s painted a beautiful Botanical Green, so whatever I choose needs to go with this. 2) my old fashioned screen doors are the same green and I really want to keep them that way. 3) the mullions on my windows are black and I would love to have the storm frames painted black as well. 4) I prefer that the house and all the trim be the same color. So…. I originally wanted pure white, but then I considered very dark charcoal gray (nearly black) and then I considered a dark brown. Then I was back to white. Now I am considering a mustardy butternut. Most likely I will stick with white as I’m afraid I will tire of something too crazy. ack!? Love the new carpet, great choice. Beautiful choice, Kevin! I think the pattern should follow the curve of the staircase to flow with the architectural lines, not detract from them. I’m still shopping appliances! I’m glad I’m taking a long time, as I’m learning so much. It’s a purchase that’s to last many years. Note to Kate: How about a light or medium sage green? I bet you can find a shade of that gray-green color that picks up the surrounding green and black. It’s also a very calming and stately color, and not easy to tire of. I do not want to throw water on your parade, but if either of you get vertigo, will the pattern in the carpeting make it worse??? I have been starting to contemplate carpeting my (curved) front entrance hall stairs. When I saw that England photo I sucked in my breath, all ready to ask you WHERE DO I GET IT before I saw the words. …..but back in the real world- thank you for the tip about solid color showing the lint. Will remember that! 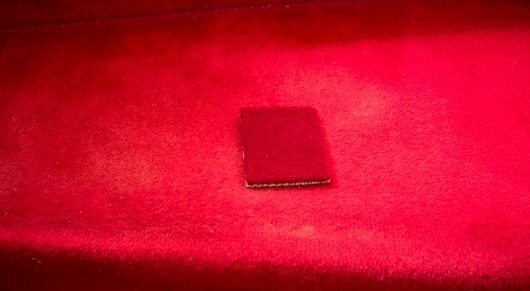 The crimson will look great as I took almost the same off my staircase of my old house…was worn out but really didn’t show it. As for projects, we bought an Amish house, no electric, plumbing, furnace etc. GOOD solid built home though on 5 acres in the country. All wood floors being redone. Final electric and HVAC to be done Monday. Plumbing in the next week. Painting and floors and tons of little things and a few more big things yet to do…Hope to move by Oct 1st. 1) I too love the photo of the ‘ideal’ grand staircase with its blue carpeting. 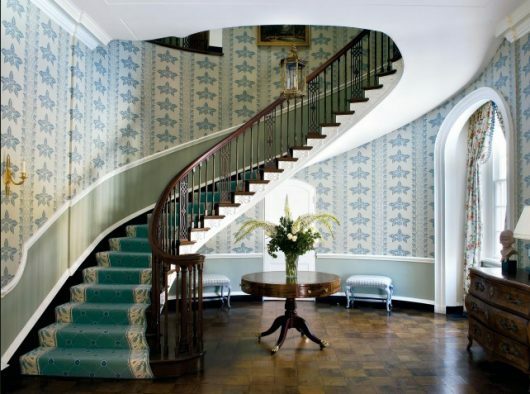 My first thought was not ‘where can I get the carpeting, but where can I get this staircase…? 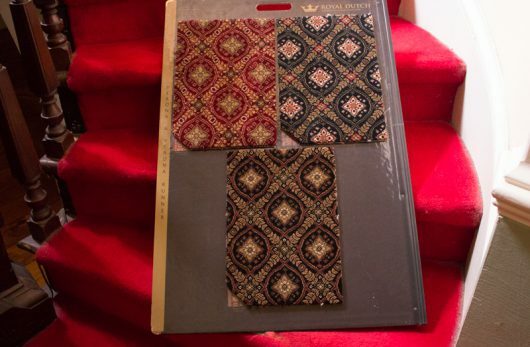 2) When I saw the winning swatch of chosen carpet, my immediate reaction was that it will go so very nicely with the hallway runner you already have. Great choice of carpet in my mind. Absolutely correct about hiding bits until cleaning time. Also, agree with other comments about installing pattern to fit the curve of the stairs. Will you cover the entire riser and step or refinish the wood treads and have the carpet be a sort of runner down the center of the stairs like your ideal blue photo? I really like the carpet choice for your staircase Kevin. It goes so perfect with the walls of your hall entrance. To Kate, I agree with Maraya’s suggestion for the house color and I too was going to suggest some type of gray-green color for the exterior of your house that would tie in nicely with your garage/shed. I have grey green in different areas inside of my home and I love it. Have never tired of it. advantage to knowing you are going to lose your home is that you don’t have to struggle with getting workmen to show up and do good work to remodel. After nearly a year, workmen here are only taking large jobos and still charging triple prices because of desperate flooded homeowners. Houston homeowners who can do so have moved to other cities where the weather is not so violent and they will be safe. As for your red jarring carpet, how did you stand that for 16 years? Your house is lovely, except for the flamboyant carpet. I once had bold blue/navy/putty on cream uneven plaid wallpaper in the kitchen and breakfast room. The plaid was not small. I loved it for nearly 20 years beyond reason I suppose. When I remodeled the kitchen, the decorator was adamant that wallpaper was OUT! Instead the walls were painted three shades of chino, a soft subtle khaki color with white appliances and cabinets and dark red tile floors and chino colored rough tile backsplash. Paint is very boring compared to the lively wallpaper that was removed. I still miss that wallpaper! I hope you don’t miss your red carpet. Wonderful choice. Looks like it will do more than go with the wallpaper, but will also enhance it. We’ve got projects ongoing here but not nearly so elegant. Growing and educating kids, my graduate work, etc., got in the way of the more mundane stuff earlier… as Gilda Radner once quipped, “It’s always something!”After 40 years it’s more than time to replace the bath fixtures which, of course, means replacing the wallpaper (somewhat newer, I might add!) and shower surrounds also. We anticipate being in our home about 5 more years, so it’s not a big re-do. This is a clean-up and refresh from the Ancient. Harvest. Gold. GAK. Yeah, I’m really dating myself, but we didn’t chose it. Someone went to contract on the house before us, then backed out and we had no real choice at the time, but to accept what fate handed us. Now we are eagerly handing it all back to fate despite the temporary chaos it will create. Hope your carpet installation goes smoothly! Can’t wait to see the “new” stairway! Currently redoing the master bath. Ugh! Have had to move out of my bedroom as it is uninhabitable while this is going on. Instead of two weeks it will probably be more like 5 weeks given that the workers have had an awful flu that is going around and the 4th holiday and a couple of “while you are at it.” Throws a problem in the timeline to say the least. Gosh, I just hope I like it after it is done! Third go around for me on this, as the first time they did a terrible job, then the house flooded, and now. I sincerely hope this is the last. You will love the red print – A few years ago we were looking for a new area rug for our family room – we had gone from off-white wall-to-wall, then had hardwood installed and we put in an olive color area rug (what were we thinking??). Anyway when it was time to replace that green thing we made the bold decision to go with a red print wool rug. Wow – what an impact! After a number of years we just redecorated, and we now have a soft blue, cream, with multi-colors wool rug. It is just beautiful, but I still remember the day we put the red rug down and what a WOW factor it was. Perfect choice! Solid dark colors are always a bugger with lint and everything magnified with the dark background. The pattern is just right in many ways – hope the installer figures how to have the pattern follow the curve of the stairs – very important. Look forward to the final photos. Lovely carpet. How about stair rods to complete the traditional look? I have them – mine are simple brass rods, but there are many options . I’m one of your readers of this fabulous blog and I love your good sense of humor it is always make my day. Just a very simple advise from the designer point of view. You should pick up one of the colours from your existing runner what you have in your hallway / if you want to keep it for a longer time / the colour which will match also your existing wallpaper/ and this colour should be used as an complimentary color /staircase/for the hallway to play the symphony as supposed to be in regarding to make a sophisticated and very elegant classy look. I love your wallpaper and color choice for the wall beneath the chair rail. Your choice of carpet for the stairs is bold and will definitely draw the eye to the staircase which is beautiful! What are your thoughts on a runner going up the stairs to show the wood on the steps? I really like the look of wood showing, you? So sorry to hear Jesse’s situation. It sounds rather miserable and life is impacted negatively. In NJ where Supper Storm Sandy destroyed so many homes and severely damaged more, people have raised their houses to, or above, FEMA’s 100 year flood level and their actions result in reduced flood insurance charges. That level varies by location as some must withstand the beating of waves and others just the rise of waters like along the Buffalo Byou in Houston. I believe in Singapore houses are required to have holding basins underneath for water and the dirt dug out can be used to raise the building. Though the Texas spirit of independence is admirable in some cases, the lack of zoning and building laws in Houston results in unchecked, unguided building and hardship. The new carpet is even better than the old one! I too learned the hard way about solid color carpets. Beautiful choice! Ongoing at our home at the moment: installation of five window boxes, redo of guest (grandkids’) bedroom, exterior repair and painting, building new front steps. Much more on the list, but that’s as far as the budget takes us at the moment! Eager to see your carpet installed — thanks for sharing! might work out on a winding staircase. Did that come up for you Kevin in your decision process? Hello Kevin, you’ve had to make so many many choices, that personally my head would be spinning, and always chosen with a bit of whimsy. I love that part of you. It cheers me endlessly to see your smiles, your hugs and your sighs in every decision! I, too, LOVED that teal/aqua staircase.. it has a quiet cheerful energy to it. And when you showed your final choise.. o my gosh.. its soo cool.and I know you’ll be so happy dancing down those stairs! Thank you so for sharing. Much love to you and yours♡. Fran, we know about Superstorm Sandy in New Jersey and watched with horror the results. Thanks for your comments. The Independent Spirit of Texas you mention as far as no zoning and caving in to greedy developers provides a lot of bribe money for our politicians. Within weeks of Hurricane Harvey and the Army Corps of Engineers panicking and releasing massive flood water into our homes, developers were at Houston city council meetings brazenly requesting permission to build 900 homes in an open area that is needed for flood control. To build there will increase flooding down the line for already built homes. Of course the mayor and all of city council unanimously approved the request despite citizen protests and the old Pine Crest golf course will now be dense housing and concrete streets to increase flooding. Being a easily-owned politician or disreputable developer is one way to get rich in Texas and elsewhere. From what I’ve read, the same in NJ! The cost of raising houses starts at about $225K+ and we can’t use dirt as you do. We use concrete. The flood level is around 5-6′, so this makes for an ugly house height and lots of stairs to climb. 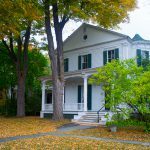 Requires we change our deed restrictions. If the reservoirs break, the water flood level will be about 20-30′ in our neighborhoods and downtown out to the Houston Ship Channel at the Port of Houston and all the chemical and oil plants will collapse into the bay and poison the environment. Think how much you’ll pay for gasoline then!! And you won’t be able to eat the seafood. No tourism. No more Houstonians! Maybe we should all move to be neighbors of Kevin. He seems to be safe in his cozy old house that has withstood the centuries. Only has lots of snow in the winter and then his house looks like a snowy holiday card. Wouldn’t it be fun to be neighbors of Kevin and Mr. Fox? 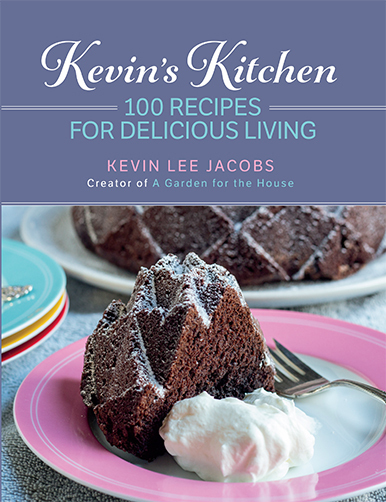 Despite ongoing remodeling, Kevin seems to live a placid, joyful, civilized life style and not in danger from deadly weather. All of us who follow Kevin are like-minded and we would have a delightful community of friends. Complements on your choice of new carpet, which should prove to be a most elegant and complementary solution for your grand staircase. Best wishes for the project & your wonderful Summertime. I love have exquisite taste. I love the red and was relieved to see you were able to find an equally stunning choice that isn’t so high maintenance. Your house is really quite the showplace now!! I really must learn to proof. YOU have exquisite taste. Good choice. We have a faux oriental rug in our entrance for the last 20 or so years…muddy boots and paws, grit and gravel from the driveway, nothing shows. But the noise going up the vacuum lets us know the abuse it takes! Project coming up? Replacing the vinyl cover on the deck that is the lean-to greenhouse roof..before it starts to leak! I love your house. I admire your faithful dedication to beautifying it and keeping it maintained. That house was very fortunate to have found you! I can’t wait to see the new carpeting on the staircase. Beautiful!! Kevin, I have pretty much the same pattern as you chose on my stairs, only with a navy background. Have had it for years, it has stood up through 3 Newfoundland dogs, and is still going strong. Hope your carpeting wears as well as mine has here. And I’m still not tired of the design. I’m curious. 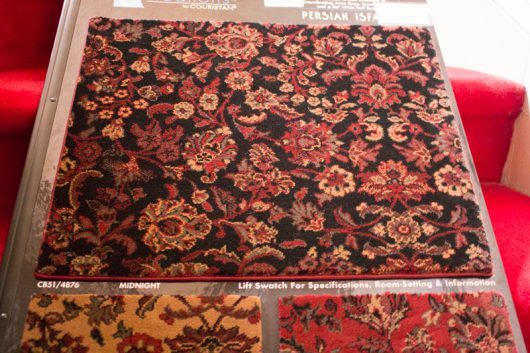 Since you clearly covet the soothing colors and style of the “dream carpet”, why are you still going with the garishness of red tones and the business of an all over print? If it were me, I would 1. 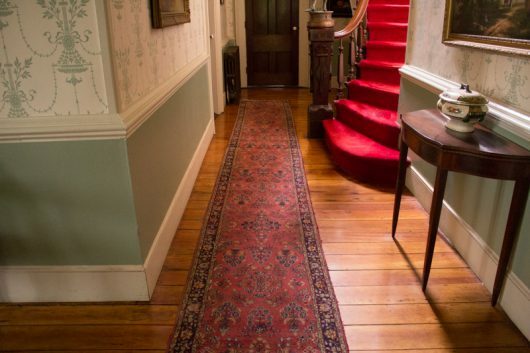 Find a way to obtain the carpet of my dreams from England. And in that unlikely event, I would 2. Emulate it as closely as possible with a similar offering from the USA that harmonizes with your existing wallpaper and creates the same soothing feeling as shown in the “dream carpet” photo. Your “gut” is telling you one thing (dream carpet) yet you appear to be overriding it. Why? I love your choice. It’s very rich looking. I have a problem that, with all you restoration experience, I think you may be able to help me solve. I put a natural seagrass rug with a foam backing in my family room (over hardwoods) eight years ago. It was starting to show it’s age and I ordered a new carpet. I’m in Savannah, GA, so it’s pretty humid here all year round. When we went to take up the seagrass rug, almost half of the foam had stuck to the hardwoods. I first used a broom to try to loosen the foam, then used a Dyson, but there is still a lot of foam left on the hardwood. I tried Bona on a small section, but it just made it worse. Any suggests on how I get this foam off the hardwoods without ruining them? PS – Love your blog. Look so forward to reading it. Thanks! 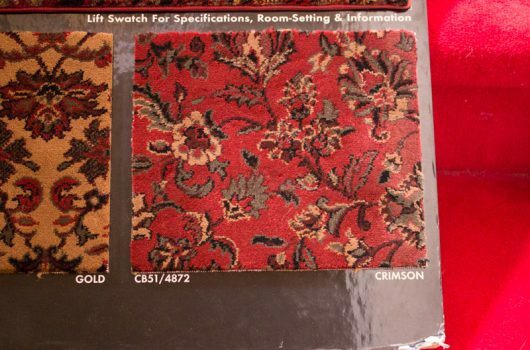 Spot on with the carpet choice: great dramatic color and the pattern will hide lint and such! Can’t imagine how they will install the pattern up the curving staircase. Thanks for sharing all with us. Oh Kevin, how I wish I was there to TELL you what to do. Where oh where did I put that transporter? Sorry, that’s how I am. I know those patterned red carpet always looked so good in those old high end movie theaters. With those lovely walls you have putting something like your final choice of carpet just doesn’t do it. Went through all the comments and at the end Jamie finely said what I had been thinking all along. Surely you can hunt and find something similar to your DREAM. ( Yes, you would have to do something with the runner also. Sorry. Hi Maddie – Here’s what I would do. Contact a local floor-refinishing specialist. He or she will undoubtedly know how to remove the foam carpet-backing which has stuck to your wood floor. True, you may have to pay a small fee for the consultation. Money well spent, in my opinion! Niiiiiiiiiice choice Kevin. Please be sure to have the before and after pics next to each other. Look forward to seeing the finished product. So many opinions…I love the crimson! It’ll be wonderful! I’m trying to figure out whether to paint or wallpaper the ugly paneling that is in the stairs to two spare bedrooms on our second floor. We rent out to students. They don’t care but I’m not a paneling fan! Ps- I’ve wondered about the height of your work station (island) that you use. You appear tall and I’m wondering if you altered it? I’m tall and would love to have countertops two inches taller to save my back! I love it and can’t wait to see it installed!!! While I really like it, someone taught me that if you can’t match, go different. Did you check out how your 2 reds really go together? 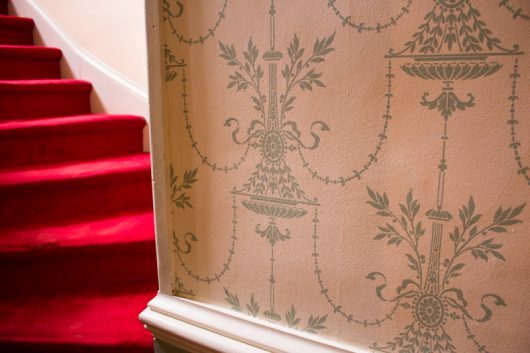 You don’t want it to look like you tried to match and failed…I do love your runner and gorgeous stairway! Good luck! Just last week the replacement of most of our windows was completed. Since all the furniture was pulled away from the windows, we also refinished the sills, that had been damaged from moisture during several way below zero days last winter. The last coat of varnish went on today. We had bad wind storms last week and lost a tree and a big branch from a maple , broke off the very top. My neighbor cut and hauled the branch off my garden, where it landed. The tree is still waiting to be dealt with. It’s laying in front of my compost pile & behind a woodland garden. Our temp’s have been in the high 80’s with heat index of close to 100 degrees, so I’m just not inclined to dealing with those branches. We removed glued down carpet with foam backing from a maple floor many years ago in a previous house. We used an ice scraper tool with a long handle. It worked great, didn’t damage the floor. It was professionally sanded after we removed this carpet tho. You living in Georgia probably don’t have one of these tools hanging in your garage, do you? Your home and style strikes me as more eclectic than matchy-matchy. 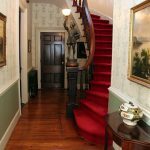 With that said, I think you are going to love your color and pattern design choice for the centerpiece stairs much more than what you called that European dream stair runner and wallpaper. 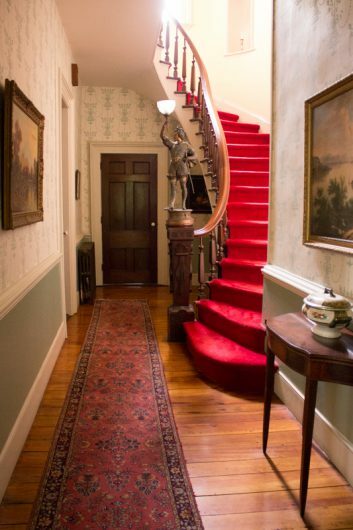 Crimson red is a classic color that complements your oriental hall runner and lets your hall walls stand for themselves. The floral design pattern and color is also a classic design. Your choice should mute specs of crumbs and pet hair between vacuuming periods. I think your grand old stairs will be transformed from looking theatrical drama to gorgeous classical! Great CHOICE!